At the end of your adventure, relax and enjoy a drink in historic old Montreal! This tour starts at a bike shop in Old Montreal. Gather the necessary equipment for the day—a bicycle, helmet, lock and a bottle of water. Then after a quick safety briefing, hop on the bike and follow the guide to downtown Montreal to begin the adventure. This enjoyable 11-mile (17-kilometer) journey travels along the Old Port of Montreal, the Village, La Fontaine Park, Plateau Mont-Royal, Mile-End district, Jean Talon food market, Little Italy, Mount-Royal Park, McGill University campus, Business District and Old-Montreal’s famous Place D’Armes with the Notre-Dame Basilica. Along the way, learn about Montreal’s history and architecture while sampling urban gourmet discoveries. 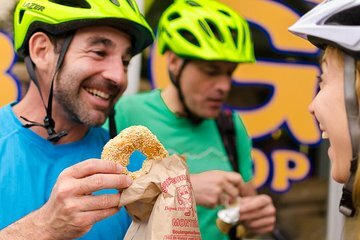 Visit the city’s food hotspots including Montreal’s famous bagels at Saint-Viateur Bagel shop, German sausage sandwich at the Jean-Talon market, the “vrai gnoccis de la nona” in Little Italy, a gelato at “Les Délices de l’Érable”, and a glass of beer or wine in Old Montreal. At the end of your adventure, relax and enjoy a drink in historic old Montreal. At the end of the tour, return the bike or keep it for the remainder of the day (until closing time) to explore the city individually.